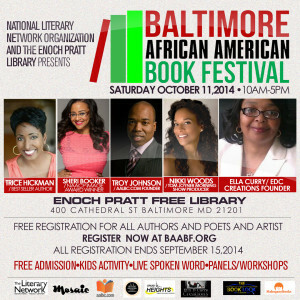 Okay artists, writers, poets/spoken words artists, and book lovers: If you didn’t know, the Baltimore African American Book Festival (BAABF) is this Saturday, October 11, 2014 from 10AM-5PM at the Enoch Pratt Free Library. Presented by the National Literary Network Organization and the Enoch Pratt Free Library, the BAABF will feature Trice Hickman (Best-Selling Author), Sheri Booker (NAACP Image Award Winning Author), Troy Johnson (AALBC.com Founder), Nikki Woods (Tom Joyner Morning Show Producer, Nikki Woods Media Founder, and Author), and Ella Curry (EDC Creations Founder). Other events include panels/workshops, kids activities, and live spoken word. The event is free and open to public. 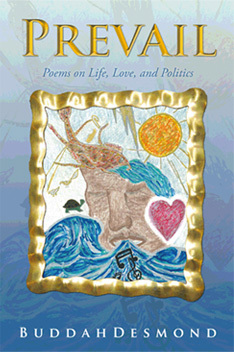 I’ll have a table (#10) selling copies of Prevail and Exotic Shifter and will perform during the Spoken Word Hour from 1PM-2PM. My blogger buddy Marc Polite (Author, Blogger, and Founder and Editor in Chief of Polite On Society) and will be one of several authors appearing at the event as well. So if you’re looking for a FREE event full of great edutainment, come check out the BAABF this Saturday in Baltimore, MD! This entry was posted in AALBC, BAABF, Bloggers, EDC Creations, Ella Curry, Entertainment, Exotic Shifter, Inspiration, Marc Polite, Motivation, Nikki Woods, Poetry, Poetry Reading, Prevail, Sheri Booker, Spoken Word, Trice Hickman, Troy Johnson, Writing by BuddahDesmond611. Bookmark the permalink.